With the exception of signs that attach directly to a wall we always finish the back side of our dimensional signs with a little more dimension. A minimum standard for a free standing sign would be to texture the back and then paint it the same color as the background or edge border. We always laminate our brackets and frames between layers of the sign with only the mounting points showing. This reduces clutter and makes our signs a whole lot stronger. But often we go even further for maximum effect. A current sign is a good example. 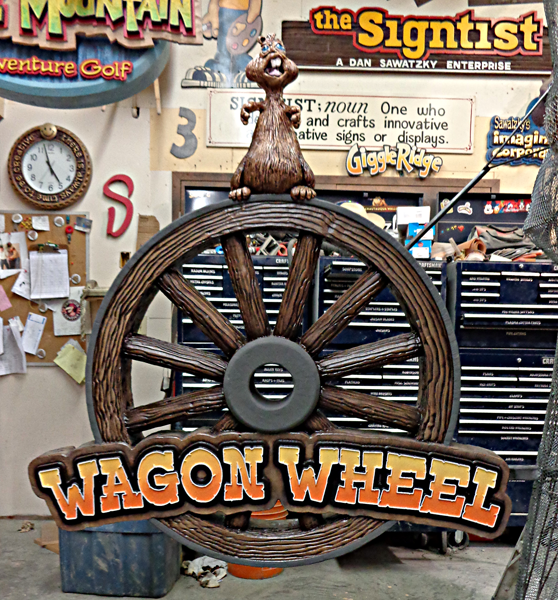 Everyone will see the front of the wagon wheel sign as they approach the attraction. Some will notice the back as the waiting line for the ride loops back. The sign will be mounted to a ticket booth with the bottom of the sign about seven and a half feet off of the ground. It is plenty close to get a good look at the details. We probably could have gotten away with a flat, dark painted back on the sign but we could do so much better. A fully dimensional and textured back was the first step. The sign back received the same three coats of base color and the three colored glazes too. 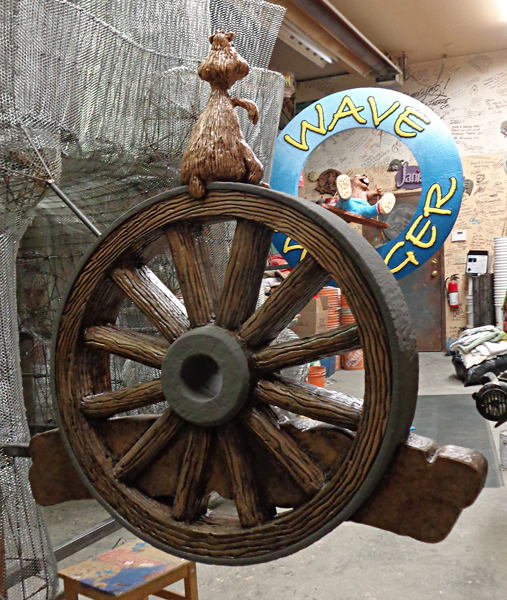 Details like a hollow hub and little prairie dog tail will reward those who take the time to look. We take extra care coming and going on our projects.